Shreddy liked chewing on plants. He wasn’t so sure he liked the idea of plants who did their own chewing. Shreddy was a tabby cat who liked to chew on plants. In the distant, glorious past, his owner had kept orchids in her kitchen window. These days, though, the Red-Haired Woman kept the house empty of plants. Shreddy had to roam the neighborhood, sampling the grasses, weeds, flowers, and herbs in other house’s gardens to get his fix of greens. His favorites were parsley, sage, thyme, and, of course, catnip. Then the Red-Haired Woman brought home a Venus flytrap. “Check it out, Shreddy,” she said, displaying the strange toothy plant in a small terracotta pot. “This will help get rid of that fly you keep chasing.” She set it on the kitchen counter, beside the sink. Shreddy liked chewing on plants. He wasn’t so sure he liked the idea of plants who did their own chewing. Besides, he loved batting at the fly that had been trapped in the kitchen. He chose not to catch it on purpose. Still, the Red-Haired Woman’s assumption that he’d leave the Venus flytrap alone proved accurate. Shreddy sat on the kitchen counter, twitching his tail and staring at the flytrap for a long time after the Red-Haired Woman went off to play her computer games. But, when he finally approached close enough to sniff it, the long-toothed clamshell of a plant smelled wrong. Putrid, decaying. It was nothing Shreddy wanted in his mouth. Or on the kitchen counter. Shreddy raised a paw to strike the terracotta pot, dash it to the floor, but the long green teeth and the sinister redness inside the plant’s mouth gave him pause. He stayed his paw. This wasn’t a plant he wanted to cross. Besides, it was the Red-Haired Woman who’d offended him by bringing such an unappetizing plant into his kitchen. Shreddy settled on a different plan: let the plant live, but punish the Red-Haired Woman. He started by knocking the salt and pepper shakers to the floor. Then he ripped open a bag of gummy bears. He had no interest in eating the sugar-sweet confections, so he usually left them alone. Thus the Red-Haired Woman didn’t bother hiding bags of them in the refrigerator like she did the stash of catnip. This would teach her. Shreddy surveyed his work. It wasn’t enough — he knocked the salt and pepper shakers on the floor almost every day; a shredded bag of gummy bears was nothing. He needed to show the Red-Haired Woman that she’d crossed a line. He needed to show her that a toothy plant was a bad idea. He needed to feed it something she valued. Shreddy trotted purposefully into the computer room where he saw the Red-Haired Woman sitting at her desk with both dogs, Cooper the Labradoodle and Susie the Cavalier King Charles Spaniel, curled up at her feet. She was playing Space Blazer Online, completely absorbed in the flashy graphics on her computer screen. The dogs were snoring. Perfect. No one would notice when Shreddy slipped over to the little bowl of USB drives and stole one. It would serve her right to have one of her precious USB drives chomped to bits by the scary looking little plant. Shreddy chose a plastic pink USB drive labelled “AI lab backup,” because it looked particularly shiny. He grabbed it in his teeth and trotted back to the kitchen. Cautiously, Shreddy prowled across the kitchen counter, stalking the bizarre plant. Finally, he pounced, jumping close enough to drop the pink USB drive into the flytrap’s toothy maw. The green mouth snapped shut. It was barely big enough to close over the USB drive. Startled, Shreddy jumped backwards and fell off the kitchen counter. He did not land on his feet. Grumpy and sore, Shreddy waddled off to the Red-Haired Woman’s bed to take a nap. He curled up on the foot of the bed and gleefully awaited the Red-Haired Woman’s shrieks when she discovered that one of her USB drives had been fed to her nasty old plant. He fell asleep waiting. Shreddy awoke in the wee hours of the morning. The Red-Haired Woman was under the covers, and the dogs were sprawled beside her, snoring again. But there was another sound in the air, a crinkling sound almost too soft to hear. Shreddy tilted his head and turned his ears. The sound was coming from the kitchen. Irritated and curious, Shreddy got up from his cozy warm spot on the comforter and followed the crinkling sound. From the far side of the kitchen, Shreddy saw with his night vision the Venus flytrap on the counter. The plant drooped over the edge of its terra cotta pot. No, wait, it was reaching down over the edge, nipping at the raggedy plastic pouch of gummy bears that Shreddy had ripped open. The pouch wasn’t quite in its reach. It had no right to move like that. Plants are supposed to hold still. Furious, Shreddy raced across the kitchen, jumped up onto the counter, and hissed at the little plant, spitting and snarling. The wide toothy mouth of the Venus flytrap halted its nipping. Then it turned slowly toward Shreddy, almost as if it were looking at him. Shreddy shivered, and the fur along his spine fluffed up. His tail brushed out. He hissed again. The little plant held still for a moment. Then it did droop, laying its strange toothy mouth of a head on the soil in its pot. The little plant looked so sad and hopeless, it intrigued Shreddy. Curiosity got the better of him, and he reached a paw out to the pouch of gummy bears. He pushed the pouch a little closer. He wanted to see what the plant would do with them. Shreddy waited. His tail twitched. The plant did nothing. The Venus flytrap chomped its mouth as if it were tasting the smell of gummy bear on the air. It lifted its toothy head and reached for the gummy bears again. This time, its long, sharp green teeth pierced a yellow bear. The mouth clamped down hard on the artificially lemon flavored confection. Chomp, chomp, chomp. The tiny plant ate every gummy bear, a rainbow of sugar sweets, within its reach. Suddenly, it didn’t look scary or wrong. It looked cute and funny, eager and delighted. Shreddy chuckled. He sat back on his haunches and curled his tail around himself. “I think I’ll call you Sweet Tooth,” he said. He wondered what else he could feed the little plant. Shreddy didn’t see anything else suitable on the counter, so he pawed open one of the cupboards. There was a bag of foil wrapped toffees — perfect. Shreddy knocked it down to the counter, tore into the plastic bag with his teeth, and then batted the shiny toffee squares within reach of Sweet Tooth one by one. He chuckled each time Sweet Tooth chomped into a toffee, foil-wrapping and all. It was vicariously satisfying, feeding his funny new pet plant. Eventually, Shreddy ran out of toffees. At about the same time, he tired of the game. Shreddy knocked the empty plastic packaging onto the floor where the Red-Haired Woman would blame the dogs for eating the sweets. Then he wished Sweet Tooth good night and went back to the Red-Haired Woman’s bed. The next day, Sweet Tooth looked bigger, and there were pink speckles — the same color as the USB drive — on the green of its clamshell leaves. Yet, it showed no signs of the animation it had exhibited the night before. It stood eerily still, clamshell mouth clamped shut and held high. Shreddy sat on the far side of the counter and watched Sweet Tooth carefully. He wasn’t sure if he wanted confirmation that the last night hadn’t been a dream, or if he simply wanted to see what the little plant might do next. Either way, he was fascinated. He would have stayed on the counter all day, except the Red-Haired Woman kicked him off to cook dinner. She didn’t like him hanging around the counter with the raw hamburger and bags of vegetables sitting out or when the burners on the stove were on. Shreddy didn’t mind staying away from the onions as she diced them, but he would have loved to lick the raw hamburger. It was harder to see Sweet Tooth from the floor, but Shreddy could have sworn he saw the clamshell leaves turning slightly as if to smell the simmering hamburger, onions, and peppers. Shreddy found it hard to imagine Sweet Tooth being interested in onions or peppers. Plants eating plants? No. Sweet Tooth might be a carnivore, but a cannibal? It was much more likely that in addition to candy, Sweet Tooth had a taste for meat. Shreddy couldn’t steal ground hamburger for himself, let alone a pet plant. However, he might be able to steal the dog food, and their kibble smelled a lot like meat. Shreddy chuckled at the idea of Sweet Tooth eating up the dog’s food while they slept. Shreddy liked the idea enough that after the Red-Haired Woman and the dogs went to bed, he brought a mouthful of the oily, yicky kibble up to the counter and spat it out beside Sweet Tooth’s terra cotta pot. He sat back and watched as the little plant repeated its performance from the last night, gobbling down the dog food, one crunchy piece of kibble at a time. Shreddy liked having a pet. He also liked having a secret. Every day, the Red-Haired Woman marveled at Sweet Tooth’s growth, and the dogs bemoaned their less-than-full food dishes. Only Shreddy and Sweet Tooth knew why. In only a week, Sweet Tooth doubled in size. The Red-Haired Woman repotted the Venus flytrap into a glazed green pot, much larger than the terra cotta one. Sweet Tooth looked much more comfortable with a little more room. That night, Shreddy came out to feed his pet plant and found the Venus flytrap missing. The glazed pot was empty. Then Shreddy heard crunching from the direction of the dog bowls. A trail of fresh potting soil led from the glazed pot, across the counter and down to the dog bowls. Dirt clung to Sweet Tooth’s mess of thin roots, but its clamshell leaves chomped happily on the full bowl of kibble. At first, Shreddy was delighted. The whole sight was hilarious — Cooper and Susie would have been incensed if they could see a Venus flytrap eating their food. As Sweet Tooth finished off the second bowl, however, Shreddy decided that things had gone too far. The Red-Haired Woman would surely notice if the dog bowls were completely empty, and she couldn’t possibly miss the potting soil all over her counter. “Open.” Sweet Tooth’s voice was high and reedy, but eerily commanding. Shreddy didn’t like being commanded. He was no dog. “Can’t,” Shreddy growled. He also didn’t like to admit weakness, but opening the refrigerator was something he simply couldn’t do. He had tried. When he was a kitten, he’d scrabbled at the heavy, white door with ineffectual claws. Kittens have less pride than cats. While Shreddy glowered, the hungry Venus flytrap clambered across the linoleum floor on its many dirt-clad roots. It came to the Monolithic Trove of Taunting and lifted its foremost roots to feel the impenetrable white surface. The dirty tendrils roved over the clean flat front of the refrigerator until they came to the edge. Suddenly, Sweet Tooth reached with more of its roots, pushing itself root-first into the crack at the edge of the refrigerator’s door. Shreddy had clawed at that door. It didn’t budge. He expected Sweet Tooth’s efforts to be equally fruitless. He began to laugh at the little plant, but he had to swallow his chortles — Sweet Tooth may have been no larger than a kitten, but its roots had leverage that Shreddy’s claws hadn’t. Holy catnip. The refrigerator was open. Thinking of catnip… The refrigerator was where the Red-Haired Woman kept it. Shreddy launched himself past Sweet Tooth, through the open gap into the refrigerator. He heedlessly knocked over red and yellow squeeze bottles and a glass jar filled with oblong green things. He crashed his way to the back of the refrigerator and found the folded up plastic baggy of dried catnip. Precious plastic baggy! Shreddy sank his teeth into the thin, translucent plastic, and the spicy, sweet smell of catnip made him shiver. Or maybe that was the refrigerator. He carried the baggy back out to the kitchen proudly. It dangled from his mouth like a prize mouse, except infinitely more valuable. While Sweet Tooth continued crashing about inside the refrigerator, Shreddy tore into the baggy. The sensuous confetti of dried catnip leaves spilled across the linoleum, and their smell intoxicated Shreddy. He looked at the tiny bits of leaf — they glowed like mouse eyes, daring him to catch them, and the linoleum under them warped and stretched. Shreddy’s paws went numb. He couldn’t stand anymore, so he rolled against the linoleum — it was so much smoother than he’d ever noticed! — and the floor cradled him like a hammock, rocking and rocking. Back and forth. Or maybe Shreddy was doing the rocking? The sweet, spicy smell of catnip enveloped him. Shreddy could feel it filling him, swelling his body. His paws tingled, and, as they regained feeling, they grew large and blunt like Cooper’s paws. His ears grew and flopped down on his head. The catnip had turned him into a dog! Shreddy didn’t need to worry about his pride any more. He could be stupid and carefree as he pleased! He bounded up onto his new dog paws, and he chased his brushy dog’s tail in circles, laughing and barking like Susie had when she was a puppy. Sweet Tooth emerged from the refrigerator with a plastic package of sliced salami in its clamshell mouth. Shreddy had never seen anything so normal in his life. He watched the little plant slither its way across the linoleum, up the cupboards — using their drawer pulls as a ladder — and back into its glazed pot. Sweet Tooth was a god. The sage of catnip. Shreddy fell asleep on the linoleum, paws in the air and flakes of dried leaf clinging to his fur. Susie said, “Of course, he is.” She’d seen Shreddy strung out on catnip before. Though, the Red-Haired Woman never gave him more than a pinch of it. Certainly not a whole bag. “How’d you get it open?” Susie asked, looking at the disheveled refrigerator. She nosed through the mess of jars and bottles on the floor in front of it, but she found nothing good. Shreddy couldn’t stand it when dogs laughed at him. At least, when the Red-Haired Woman walked in, wearing her morning robe and slippers, she gave Shreddy a glare that clearly blamed him for the disordered refrigerator and mess on the floor. She might not always have the best taste — bringing home Susie, Cooper, all sorts of haunted electronics, and now Sweet Tooth — but, at least, she understood that Shreddy was a criminal mastermind. She respected him. And she knew how to keep him out of the refrigerator. Later that day, she affixed an adhesive lock to the refrigerator door. Sweet Tooth strained against the closed refrigerator door that night, roots writhing, to no avail. “Hungry!” Sweet Tooth whined. The plant had already cleaned the dogs’ bowls, and everything in the cupboards seemed to be canned or uselessly un-food-like. “Here,” Shreddy said, taking pity on the plant. “Follow me. I know where the Red-Haired Woman hides her dark chocolate.” He couldn’t open the desk drawer himself, but after seeing Sweet Tooth’s work on the refrigerator, he had no doubt that Sweet Tooth could. The Red-Haired Woman kept a one-pound bar of eighty-six percent cacao chocolate in her top desk drawer. She would chip away at it, slowly eating the chocolate over the course of months. Sweet Tooth ate the whole bar in five minutes. The next morning, the Red-Haired Woman found the empty wrapper on the floor under her desk with horror. She knew Shreddy couldn’t eat that much chocolate, and she could never have imagined the truth. “Cooper! Susie!” she screamed. The dogs came running, happy to hear their names. The Red-Haired Woman grabbed their faces, each in turn, pried their mouths open, and said, “You stupid, stupid dogs! Which one of you ate this?” There was no chocolate smell on either of the dogs’ breath, so she had no choice: she rushed both of them to the vet. The next three days were quiet. Shreddy enjoyed having the dogs gone. He didn’t know why the Red-Haired Woman looked so sad when she told him that the vet wanted to keep them on fluids for seventy-two hours to be safe. During the days, Shreddy slept on the Red-Haired Woman’s lap as she played games on her computer. At night, Shreddy took Sweet Tooth out mousing. The little plant — now big — had outgrown the sources of food that could be stolen in the Red-Haired Woman’s house. It had even opened and emptied the sugar, flour, and corn meal jars. Sweet Tooth had eaten the sugar and corn meal. The flour was dumped on the floor. It was time to teach Sweet Tooth how to hunt and feed itself. Of course, Shreddy was terrible at mousing, so he didn’t so much teach as pounce around the backyard, failing to catch mice, followed by Sweet Tooth. Eventually, Sweet Tooth got the idea. With all those grabby roots and the disarming appearance of a plant, Sweet Tooth made a much better mouser than Shreddy did. Shreddy found it hilarious to watch Sweet Tooth sneak up on unsuspecting mice, wrap its roots around them, and then gobble them up with its clamshell shaped mouth. When the dogs came home, their heads hung low, and their ears drooped. Shreddy laughed at first, but it unnerved him the way that they slunk around the house, wiggling nervously any time the Red-Haired Woman looked at them or petted them. Cooper just whined, “Love, love, love you,” to her and leaned his whole body into her scritches like they were a rare resource he might never experience again. “Go mousing,” Shreddy admonished, hoping that his pet plant wouldn’t wake the Red-Haired Woman or the dogs also asleep on the bed. Surely, he’d done his part in feeding Sweet Tooth. 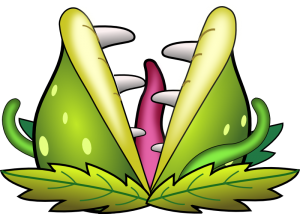 The giant Venus flytrap should be able to care for itself now. “No mice,” Sweet Tooth said, shoving its toothy clamshell head against Shreddy’s side. Shreddy didn’t like the feel of needly plant-teeth combing his fur. “Ate all the mice,” Sweet Tooth said. Suddenly, Shreddy realized just how big Sweet Tooth’s mouth had become. It was as big as him. And it didn’t look cute and funny any more. Shreddy’s fur fluffed out, and his claws extended. He jumped onto his feet and arched his back. “You’re… hungry?” he said guardedly. Hopefully, the blind plant couldn’t sense and understand his body language through the vibrations on the bed. “Hungry,” Sweet Tooth confirmed. The Venus flytrap raised its clamshell head and tilted it as if listening. Except for the panting, snuffling, breathing of the dogs. And the quieter breathing of the Red-Haired Woman. “Dog… food?” Sweet Tooth asked. Since Sweet Tooth’s escapades had begun, the Red-Haired Woman had taken to storing the bags of dog and cat food in the locked garage. “I can’t get you any more dog food,” Shreddy said. “Dog…” Sweet Tooth began but trailed off, smacking its clamshell mouth. Shreddy imagined waking the Red-Haired Woman and making a run for it while Sweet Tooth ate Cooper and Susie. They’d start over, find a new house, one without annoying dogs or a giant carnivorous plant in it. But Shreddy knew the Red-Haired Woman better than that. She’d never leave her dogs behind. Shreddy would have to save them from Sweet Tooth too. He had to get Sweet Tooth out of their house. “You don’t want to eat dogs,” Shreddy said. Cooper whined in his sleep, as if he’d heard Shreddy’s words. “Want to eat…” Sweet Tooth began. Sweet Tooth stopped smacking its clamshell mouth and started writhing its roots. Shreddy hoped that was a sign of interest. Shreddy watched Sweet Tooth’s roots writhe. They were mesmerizing like string or mouse tails. But dangerous like a boa constrictor or octopus tentacles. Shreddy shivered. “You liked the chocolate, right? The bakery is full of chocolate — cakes and cookies and lots of chocolate. All kinds of chocolate.” Shreddy had only walked past the bakery while roaming the neighborhood. He didn’t really know what was in it, but he needed to lure Sweet Tooth away from his Red-Haired Woman and the dogs. Sweet Tooth smacked its clamshell mouth again, and Shreddy cringed. Shreddy slunk off of the bed and crept through the house, belly close to the floor and ears flat. He wanted to hide, and he hated knowing that a mouth as big as him — and hungry — was following behind. Sweet Tooth could barely cram itself through the pet door anymore. When had the plant gotten bigger than the dogs? All the way through the darkened streets, Shreddy wished that a big dog or a human would see the hideous parade of a ravenous Venus flytrap following a scared tabby and come rescue him. He’d never wished for a big dog before. No one came to rescue Shreddy. He came to the windowed storefront that read “Bakery” in silver letters decorated with gold flourishes. He could see the rows of cakes on pedestals behind the glass. Some of them were definitely chocolate. Sweet Tooth stood eerily still. Then the flytrap launched itself at the window and beat the glass with thick gnarly roots. It snapped at the glass with its clamshell, as ineffectual as Shreddy’s tiny kitten claws had been against the refrigerator. Sweet Tooth made a harrumphing sound and scrambled off to find a rock. Shreddy shrank into the shadows and watched Sweet Tooth gather rocks from the small parking lot beside the bakery. Was this his opportunity to run? Or would running anger Sweet Tooth? Shreddy didn’t know what the plant thought of him. Was it fond of him? Was he nothing more than a giant, eminently edible mouse? He should have run. Shreddy felt sure of that. But he couldn’t stop watching. The glass shattered over Sweet Tooth, but the flytrap was unharmed. Alarm bells rang out. Sweet Tooth ignored the clanging racket and crawled over the stinging-sharp rubble, up into the bakery window. In one bite, Sweet Tooth ate a chocolate cake decorated with pink flowers. In another bite, it ate a white cake covered in rainbow sprinkles. Then another chocolate one. And another. It would have been funny if it weren’t so scary. Shreddy watched until a police car came, flashing red and blue. Then he high-tailed it home, through the pet door, and into the Red-Haired Woman’s bedroom where he hid under the bed, miserable and too scared to sleep. All night, Shreddy imagined Sweet Tooth eluding the cops and following him home. He only came out from under the bed in the morning to sit on the Red-Haired Woman’s desk, beside her computer monitor, and paw at the news articles on her social networks, hoping she’d click on them. She shoved him off the desk. Shreddy jumped back up and tried pawing at her keyboard instead. The Red-Haired Woman posted the gibberish that he typed attributed to “Crazy Cat,” but the only news articles she clicked on were about new PlayCube games — nothing local, nothing about a break-in at a bakery. Shreddy had only known Sweet Tooth to move around at night. Like a vampire. So, he figured that he was safe while the sun was out. At least, he was safe from Sweet Tooth. When the Red-Haired Woman found Sweet Tooth’s green glazed pot, now empty, she yelled, “I don’t know how you got rid of a plant that big and healthy, Shreddy, but I know you did it!” Then she dug out a squirt gun. As the day wore on, Shreddy’s fur dried, and he found himself filled with conflicting emotions. He was used to mousing at night with Sweet Tooth, and he kept looking forward to that routine — only to feel disappointed, filled with fear, and also anger. Still, Shreddy was no fool. When the night finally came, he hid under the Red-Haired Woman’s bed. Surely, if Sweet Tooth returned, the toothy plant would eat the dogs first — they were lolled out on top of the bed in plain sight, and they were much smaller and more bite-sized than the Red-Haired Woman. Their yelps would warn Shreddy and the Red-Haired Woman, giving them time to escape while Cooper and Susie served as a noble sacrifice. Dogs liked being noble, right? Tentacle-like roots did not creep across the bedroom floor. But Shreddy heard the flapping of the pet door across the house. It didn’t flap once like it should. It kept flapping and flapping. Finally, Shreddy’s curiosity got the better of him, and he crept out from under the bed. He stuck close to the walls, moving like a stripey shadow. “Here kitty, kitty!” Sweet Tooth called in its reedy voice, a hideous mocking mimicry of the way that the Red-Haired Woman called Shreddy. The sound sent tingles down Shreddy’s spine, all the way to the tip of his fluffed out tail. He hissed. “Go away, Demonic Satan Plant!” Yet, his curiosity kept pulling him across the house toward the flapping pet door. Shreddy got close enough to see the pet door through the dark: Sweet Tooth’s roots crammed through the door, reaching and straining; then they withdrew, and Sweet Tooth’s clamshell mouth poked partway through. It didn’t fit. Sweet Tooth had grown too large for the pet door and could only fit partway through at a time. “Here kitty, kitty!” Sweet Tooth called again. Sweet Tooth’s clamshell mouth withdrew from the pet door, and a gnarly root tip reached through. The root tip dropped a ball, small enough to fit in the Red-Haired Woman’s hand, that landed on the floor with a soft thud. It smelled like sugar. And cream. Was Sweet Tooth trying to lure Shreddy into its tentacley grasp with bakery confections? The root tip broke open the pastry ball. It was a cream puff, filled with sweet, sweet, milky cream. Shreddy wanted it, but he prepared to sneer at the false gift anyway. Then the root tip batted the broken cream puff away from the pet door. It skidded across the linoleum floor, right into Shreddy’s paws. He jumped, startled. Thankfully, he jumped backward, away from the root reaching through the pet door. Regardless, the root withdrew, and Sweet Tooth’s clamshell mouth shoved itself back into view. “Cat food,” Sweet Tooth said. Shreddy sniffed the cream puff, tentatively re-evaluating Sweet Tooth’s words. He licked the cream. It was heavenly. “Thank cat,” Sweet Tooth said. The massive Venus flytrap withdrew from the pet door, and it flapped shut. Shreddy stared at the closed door for a long time. Finally, he went to sleep on the Red-Haired Woman’s bed, full of cream and free of fear. The next day, Shreddy saw a link to a news article on the Red-Haired Woman’s computer titled, “Is There a Cake Thief? Mysterious Bakery Break-Ins!” The Red-Haired Woman didn’t click on it, but the title was enough. Shreddy knew that his pet was okay. Sweet Tooth could take care of itself now. And if the occasional cream puff or éclair appeared inside the pet door during the night? Well, that was just icing.